Pebbles Blogger Template is a unique portfolio responsive blogger templates, focused on minimalism, elegance and simplicity. It’s created around a modular concept and an amazing masonry portfolio grid. 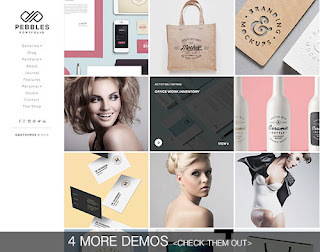 Packed with a lot of amazing features, this template offers the best solution for any niche. With Pebbles you can showcase any design, illustration, photo or product in a great way, leaving your visitors and buyers impressed with the awesomeness of your website!